Whilst I love eating my way round Newcastle at any time of the year, Autumn is definitely my favourite season for indulgence. Snuggling up in a cosy restaurant with plenty of ambient lighting and good hearty dishes never fails to put a smile on my face and the cooler temperatures make it all too easy to hide an over indulgence of carbs and cheese underneath a cable knit jumper - bliss! 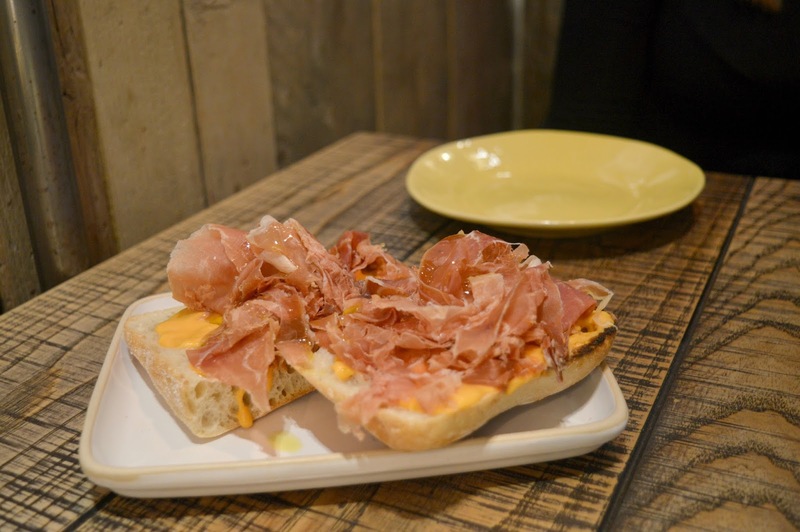 I recently revisited Tapas Revolution in Newcastle to indulge in a bit of Autumn feasting. 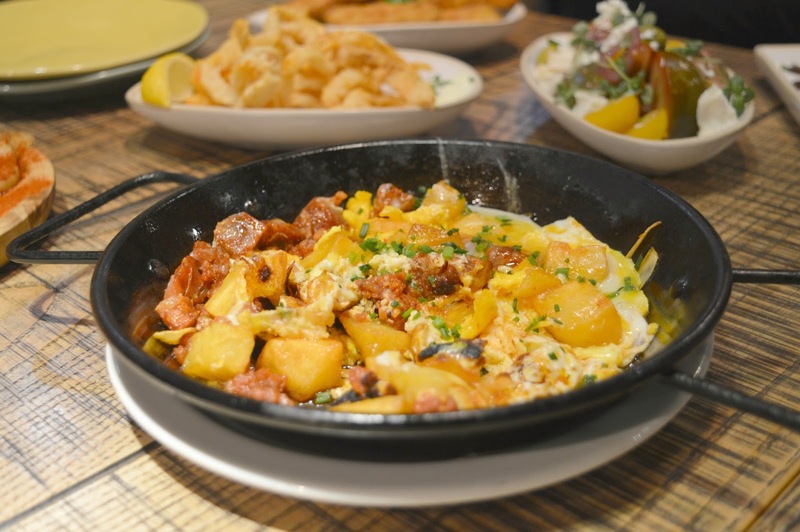 If I'm out for an evening of food indulgence I like to make sure I take a fellow foodie with me and if you're planning a trip to Tapas Revolution I would recommend going with someone who wants to get stuck in and try out loads of the menu. 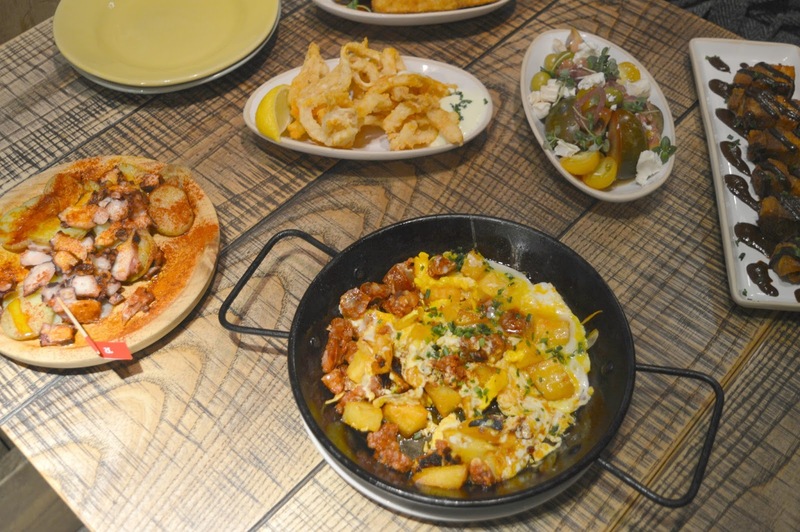 Tapas works best when you cover your entire table in delicious food! My date for the evening was my friend Sarah and we decided it would be fun to pick out three tapas dishes each and share them between us, such a great idea as I tend to get a little stuck in a rut and pick out similar dishes whenever I'm eating out. Getting a friend to choose their favourite dishes for you to try is such a great way to try things you may not have picked out yourself. 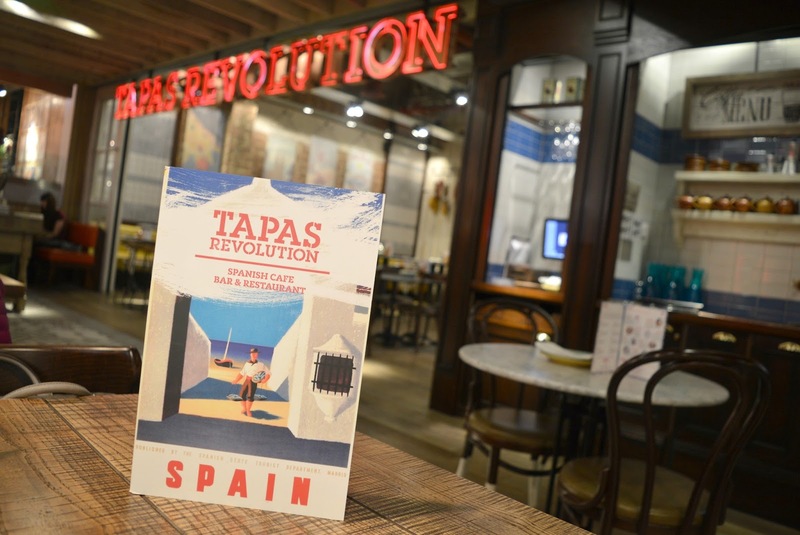 When you order at Tapas Revolution the food is cooked the traditional Spanish way which means that food is served in no particular order and arrives at your table as soon as it's prepared. The first dish to arrive at our table, and my absolute favourite (I highly recommend it!) was the Pan de la casa (£4.50) - Toasted bread, tomato topped with garlic sauce and serrano ham. It was Sarah's first try of the dish and she was just as impressed as me, it's one of the highlights on the Tapas Revolution Menu. One of Sarah's choices, and something I definitely would never have thought to order was the Torreznos con mojo dulce (£5.95) - crispy pork belly with sweet and spicy sauce. I never order pork in restaurants as it can be so fatty but this dish was perfectly prepared and I helped myself to several helpings. My favourite discovery of our meal was Huevos rotos (£5.50) - baked chorizo sausage, potatoes and free range egg. A perfect pot of stodge for Autumn, I've actually been thinking about recreating this dish at home, it was so good! Another of Sarah's choices was the Berenjenas fritas (£5.50) - Crispy fried aubergine with a spiced honey and thyme dressing. I'm not overly fussed by aubergine but they tasted incredible fried! I'm not sure I should encourage myself to start frying my vegetables although it has got me curious what other vegetables I should try fried. 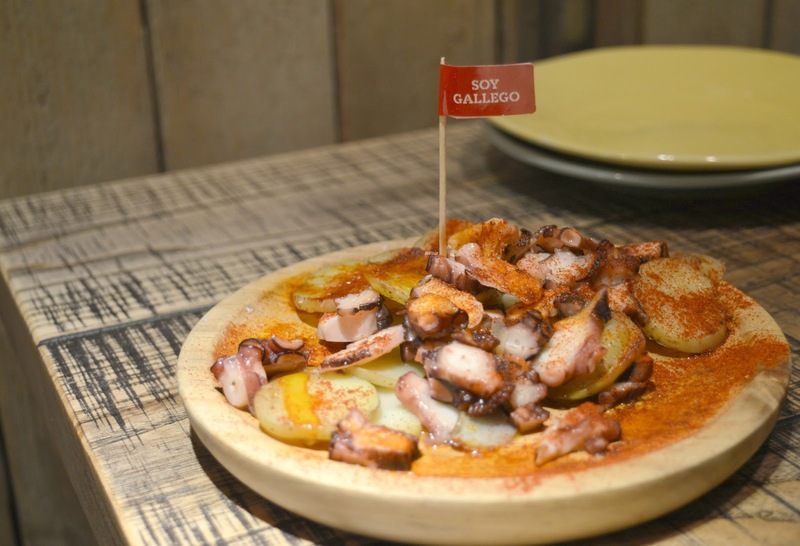 One of my favourite dishes from my last visit to Tapas Revolution was Pulpo a la gallega (£6.95) - steamed octopus with potatoes and paprika, it was my first time trying octopus and I loved it so I was keen to share the dish with Sarah. Luckily she really enjoyed it too and I'm happy I've introduced her to a new dish. In an attempt to be a little healthy we decided to pick out a salad as one of our dishes and opted for the Ensalada de tomate con queso de cabra (£4.95) - red and yellow tomatoes goat's cheese, olives, and pickled red onion. Definitely far superior to the boring salads that I usually have during the week, it was beautifully fresh and the perfect addition to our feast. 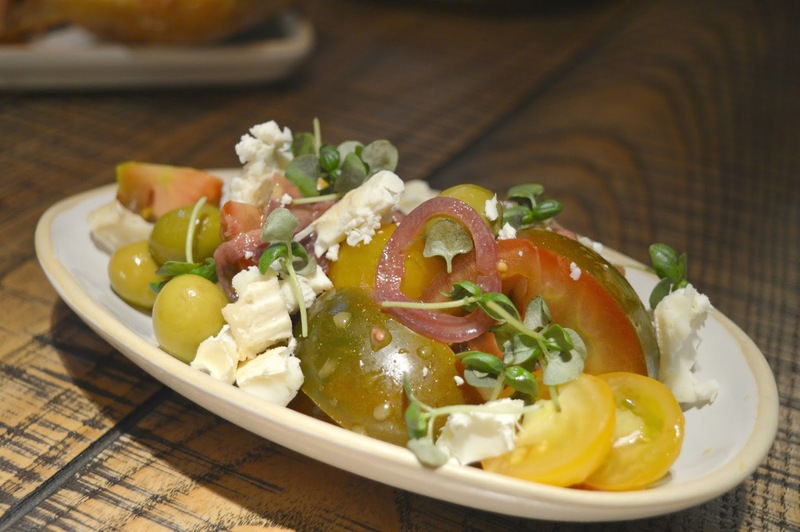 We left Tapas Revolution with very happy tummies and some new favourite dishes from the menu. I loved the opportunity to try some different things and although I couldn't resist ordering some of the dishes I'd tried before, it has made me determined to work my way through the entire menu! Let me know your favourite tapas dishes, I'd love to know what I should order next time! For more food inspiration make sure you're following New Girl in Toon on Facebook and Instagram. We were treated to a complimentary meal for two but all opinions are my own. Oh I LOVE the octopus at Tapas Revolution, it's the best! This looks amazing! Will definitely have to visit. Like the look of the pork! We loved the pan de la casa too! Great restaurant. I can’t wait to return. Looks so good...and I've still never been!